Stainless steel thermometer with attachment clip to go on the side of a pot. Perfect for partial extract brewing. A bi-metal weldless thermometer with 3" stainless steel housing, hermetically sealed in a water proof case with glass face. Ideal for fitting to your mash tun, hot liquor tank or kettle. Provides temperature readout in both Fahrenheit and Celsius. The thermometer kit include 1 x stainless washer, 1 x 1/2"NPT/BSP Lock Nut, 2 x Silicone O-rings. Requires a 7/8" drill bit to install. To prevent leaking, wrap the 1/2" BSP threads with Teflon tape prior to threading into the port. 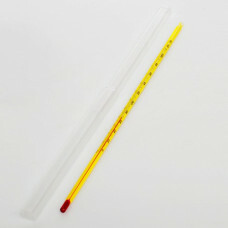 This professional ph meter is designed to measure and display both pH levels and temperature with very high accuracy. Featuring patented design, IP67 - 100% splashproof & dustproof, selectable °C & °F, large display screen, replaceable electrode, 3-point calibration system and comes with free 3 pH Powder (pH4.00, pH6.86 & pH9.18). It comes with built-in Automatic Temperature Compensation (ATC), you don't have to worry about the effect of temperature change on pH level. It will simultaneously measure the temperature as well. You can replace the probe, which is stored in an embedded sponge cap. Glass trial jar - 100ml. Suitable for hydrometer readings. Get your brewing water tested at a laboratory. The first step to water modifications is to know your brewing water. 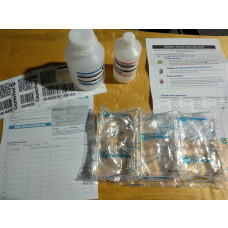 If you buy this report, we ship to you the sample containers, pre-paid freight to your closest laboratory (Hamilton, Blenheim or Christchurch), instructions, ice packs and a polystyrene shipping box to keep your sample cold during transport. Completed test results are emailed back to you once available. We believe this is currently the only affordable laboratory grade water test aimed at home brewers in New Zealand. The optional add on report uses the data from your laboratory water report to give you tailored advice on how to modify your water for a variety of beer styles. This is highly recommended unless you know how to interpret & use water analysis data. You can find an example report here. pH Buffer powder 10.01 to use for calibration of pH meters. Designed to be used with R.O water at 25 degrees celcius. Add contents to 250ml of water until dissolved.